Time flies, this is already the sixth spring for our main label and the third one for the Spring Tube Limited. Every spring we present the traditional yearly sampler releases on both our imprints, this year welcome two selections of the two scores of brand new tracks each - Spring Tube's 6th sampler and Spring Tube Limited' 3rd sampler. 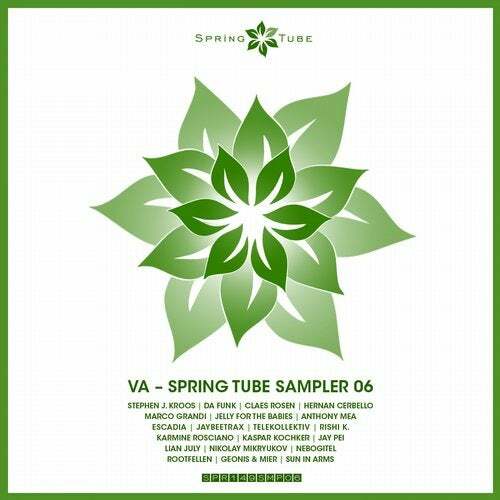 'Spring Tube Sampler 06' includes fresh original works by: Stephen J. Kroos, Da Funk, Claes Rosen, Hernan Cerbello, Marco Grandi, Anthony Mea, Jelly For The Babies, Rishi K., Jaybeetrax, Escadia, Telekollektiv, Karmine Rosciano, Lian July, Kaspar Kochker, Geonis and Mier, Nebogitel, Rootfellen, Nikolay Mikryukov, Jay Pei, and Sun In Arms. Release dates: May 27 - exclusively on Beatport; June 10 - all other known stores/platforms. 'Spring Tube Limited Sampler 03' includes fresh original works by: David Granha, Nick Varon, Namatjira, Allende pres. Magnetic Flux, Tvardovsky, Ewan Rill, LoQuai, Toppy, Monojoke, Jaybeetrax, Miraculum, Robert R. Hardy, Alejandro Manso, Slang and Technodreamer, Ronfoller, Abity, Subconscious Tales, Vou Vibe, and Clode. Release dates: May 25 - exclusively on Beatport; June 8 - all other known stores/platforms.